What Is PRP Hair Treatment in San Diego? A popular trend in hair restoration is using platelet-rich plasma (PRP) to grow hair, increase density and enhance scalp coverage. Especially helpful to thinning hair and safe for men and women, PRP utilizes your body’s ability to heal and regenerate to encourage hair growth at a cellular level. If the hair follicles and hair matrix are healthy, the growth of the hair is healthy. Growth factors present in PRP are a safe and natural option for hair restoration. Recently found to promote hair regeneration, platelet-rich plasma therapy has been used for years to facilitate wound regeneration in sports medicine, orthopedics, and oral surgery. PRP hair treatment in San Diego can be used for alopecia due to a variety of causes, not just male pattern baldness. PRP is a high concentration of platelets and the associated growth factors in a small volume of plasma. By evaluating wound healing on a cellular level, it has been found that chemicals circulating in your blood encourage cellular regeneration and proliferation. Platelets are cell fragments that help form blood clots, stop bleeding and promote cellular repair after an injury. PRP hair restoration is an in-office treatment that lasts about 30-45 minutes and typically requires no significant downtime. PRP is created by drawing a small amount of blood from your arm or hand, taking little as 5 mLs or as much as 22 mLs of blood depending on the area of treatment. In comparison, a typical donation to the Red Cross represents about 300-500 mLs of blood. The blood is collected and placed in a sterile, FDA approved container designed to process out the platelets and growth factors. The blood samples are placed into a centrifuge and spun at high speed until they separate into three layers based on density: platelet poor plasma (PPP), platelet-rich plasma (PRP), and red blood cells (RBCs). PRP is isolated from the other components and prepared for injection. Because PRP comes from your body there is no need for blood typing or risk of rejection. Dr. Kolstad injects the PRP into the scalp where thinning has occurred. Typically, a couple dozen injections are required in order to distribute the PRP throughout the frontal, temporal and occipital regions. For some patients, these injections may be uncomfortable. Dr. Kolstad prefers to use scalp cryocooling, technology releasing cold air (43-60°F) onto the skin, to minimize the discomfort caused by the injections by numbing the area. Many of our patients ask if it would be easier to lay the PRP on the surface of the skin and avoid the injections. Topical application of PRP has been shown to improve healing after micro needling and CO2 laser treatments. Topical PRP may be successful in hair regeneration but Dr. Kolstad believes that injecting PRP beneath the skin allows a greater concentration of plasma to reach the hair follicles. The hair matrix lays in the deepest layer of the skin, just above the subcuticular fat, and topical application of PRP may not penetrate this deep. How Many Sessions of PRP Treatment Are Required? Dr. Kolstad has developed several treatment protocols depending on the severity of alopecia and use of PRP hair treatment in San Diego. For most patients with thinning hair, Dr. Kolstad recommends a total of about 4 treatments, performed in 4-week intervals, as well as a maintenance treatment every 4-6 months afterward. For patients looking to enhance their hair transplant, Dr. Kolstad recommends one session at the time of the hair transplant with the second session at 3 months and the final session at 6 months post-op. 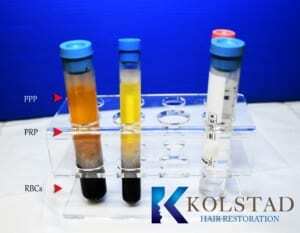 Does PRP Hair Restoration Really Work? Individual results vary from patient to patient. No guarantees of success can be made and PRP cannot restore hair follicles that have died and are lost completely. PRP hair treatment is an emerging non-surgical based therapy and preliminary PRP studies indicate patients can respond to PRP therapy. Larger case-controlled clinical studies are pending, but the current medical literature contains numerous optimistic results. PRP for hair loss is a relatively new treatment with a limited number of scientific studies to show its efficacy. The long-term benefits of PRP treatments for hair loss are not yet known. The FDA is still pending final approval of PRP treatments for hair loss. For more information about the PRP hair restoration treatment in San Diego, CA, call our office today!